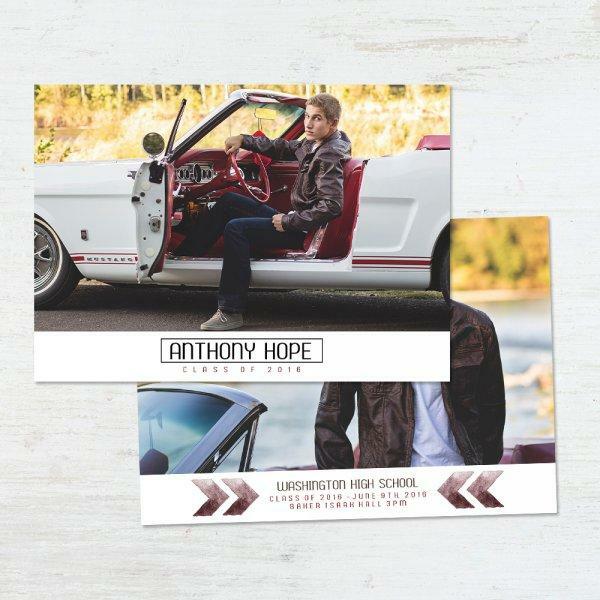 High school Senior Photography and Graduation Invitations goes hand in hand. With our templates you can impress your teenage clients and customize each design to their liking! Show your pride with customizable “Graduation Card” templates for Adobe Photoshop, with completely editable text, allowing your own personal touch. 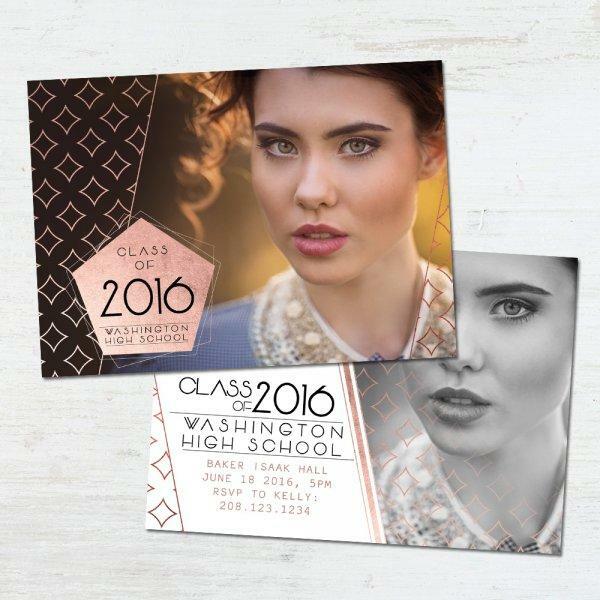 With the “Chevron” graduation card template, create cards which share your pride in a stylish, personal way. With completely editable text, the message which the card contains is your own. 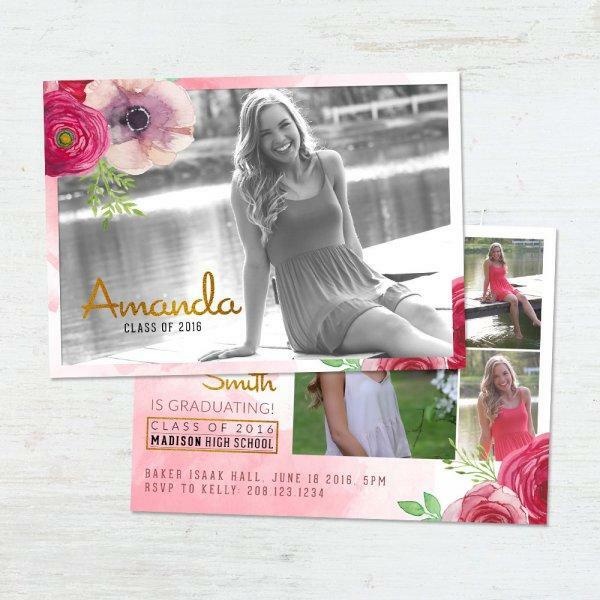 A beautiful spin on graduation invitations – This bundle will surely make you stand out. Handcrafted by our designers. A special event deserves a special invitation, where each guest will experience how it is being under the spotlight as the main character of the day, can leave everyone with an unforgettable memory. From a precarious planning level to high-class society events, invitations play one distinctive role both as a way to spread news of the event, but also as a souvenir to keep for a lifetime. A night to remember, but a card to forget? Don't let a bad layout be like the unconsidered element that might bias your celebration. It's your time, your day and your special event to enjoy. Certainly, most people out there aren't even designers in order to label you as a dull, uninteresting or uncreative person or such, but besides being an inexcusable activity to do as no one out here is free of suffering with a similar fate at some certain point of their life. In order to avoid the constant pressure of people out there, asking for graphic designers or similar to make a fancy design for your graduation card, why not look at it, knowing that all the images shown are part of your hard-work process, and that you didn't even consider calling somebody else to do the job for you - as well as thinking of the economical inconvenience of such events to many people out there. What does a Photoshop Template can give to a Graduation? Let's start by assuming how creative, filled with love your invitation is going to show. The advantage of working with many Photoshop Templates is that you are your own boss, so you won't need to hurry instead of analyzing your job a couple of hours prior printing, just to notice that somebody else out there is also using that very same style of card that you have actually paid for. When using Photoshop Templates, the sky is the limit. You can control every single aspect of the editing process, by either retaining the original color scheme and layout organization, or editing them within certain parameters in order to make them match your personal style, for nearly 1/4 of the price you usually spend on a card made at a print store; and testing as much combinations of images as you may feel up to. Personalized cards for unique events: that's the idea of working with Templates - and the best of it is that you can do that whole editing process within minutes; enough with those days lost waiting for the designer to show you the adjustments you required because, besides you, he/she also has several projects to handle at the very same time. I don't know how to work with Photoshop Templates, any help? Sure thing! One of the most amazing facts that you need to consider about templates is the fact that, as the layout is already crafted with colors and without any crazy trend, the only job you need to do with your equipment is to open Photoshop, open the file you need to work with, and then start a selection process of the images that you're going to be using for the event. These Graduation Invitation templates work under the Clipping Mask criteria; meaning that you don't even need to apply a crop tool around the image you plan to use, as clipping mask can handle the task on its own, and only requires you to resize and position the image, which can also be done after using the Clipping Mask tool. You can take a closer look at this entire process at our FAQ area or with YouTube videos that, in general, provide a clear overview on how these templates should be handled. 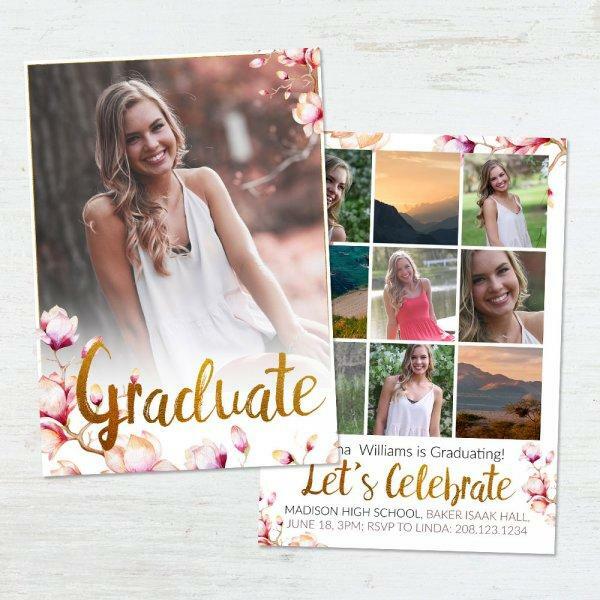 Also, below, you will get familiar with the different options for our Graduation Invitation templates by these concise overviews on how do they work and how can their style to match your life. Our “Chevron” graduation template is great for those who tend to like a more minimalistic style. With this 18x13 flat card template, you will be able to easily create a graduation card which has a clean and simple style. Containing fully editable text as well as the ability to work with both the front and back, making it cater to your own personal message and style. 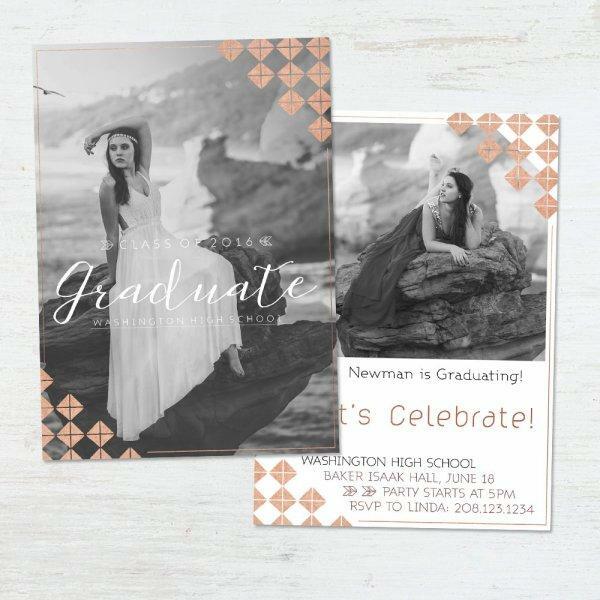 With a few more effects, our “Like a Diamond” graduation template will allow you to easily create a uniquely personalized invitation that you will be proud to share with your friends and family. With completely editable text as well as the option to work with both the front and back, this 18x13 flat card template gives you all of the tools necessary for creating a card, which when paired with a great image, will be something that will also become part of a great memory. With softer tones and a more gentle appearance, our “Sparkles” graduation template is one which goes along great with black & white images. Like our others, this 13x18 flat card template also contains completely editable text and allows the ability to work with both the front and back of the card. 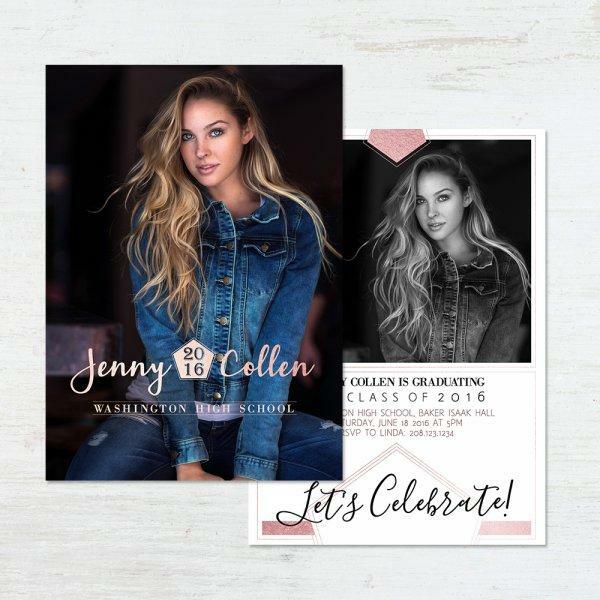 With just the right amount of effects, this template gives you what you will need to create a memorable invitation while keeping a classy and stylish look, without overdoing it.